Great expectations. That is what we all had. That is also the title of Dickens’ novel of which some was set in or around where we would be lunching today. The we, well, that would be Aaron, half of A Life Worth Eating; Ulterior Epicure; an as yet, un-aliased and unaffiliated passive foodie (let’s call him DB); our gastro-guide and master setter-upper, Moby P; and little old me. The where? That was Seasalter and its Michelin-starred pub, the Sportsman. And yes, you read right, I did include Michelin-starred and pub in the same sentence. It was a miserable day. Saturday morning. Seven a.m. Heavy rain. Moby P pulled up at the West London underground station we had designated as our pick-up point; Aaron, DB and I bundled into car and into the warmth. We were on our way to a top secret airport (let’s call it H) to fetch Ulterior Epicure and start our cross-Kent road trip. It would be almost a hundred miles and almost two hours before we reached the fabled foodie oasis. However, this is no hush-hush spot out in the middle of nowhere (well, actually it is in the middle of nowhere), for even those famous French tyre peddlers know about it and like it so much they gave it a star last January (2008). The Sportsman is a family affair with Stephen Harris in the kitchen, his brother Philip tending bar and partner Emma running FOH; the financing came from another brother, Brighton record producer, Damian. 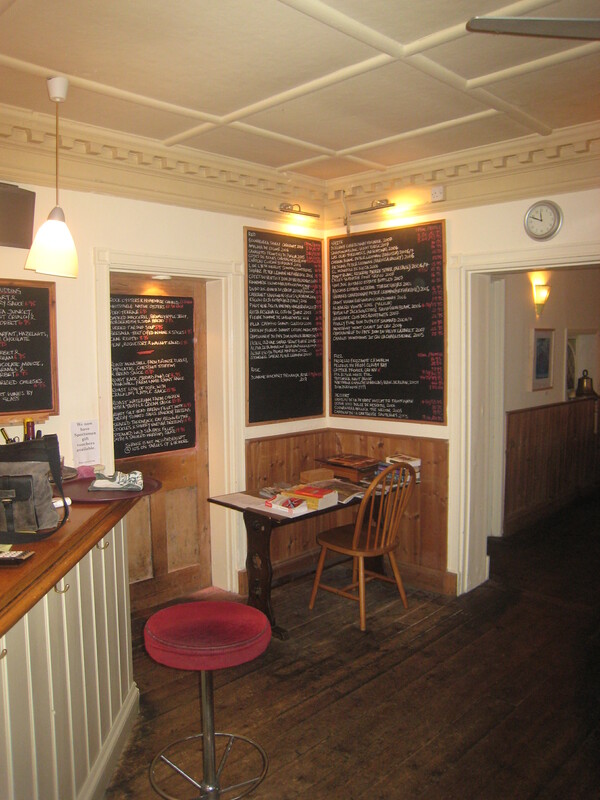 This Shepherd Neame pub opened in 1999 (Tuesday 8 November, for those taking notes) with a simple menu offering four starters, four mains and two puddings. But Stephen had bigger plans. It may surprise some to hear that the chef is self-taught; initially inspired by Ladenis, he ‘learnt how to cook by eating’ in London’s best restaurants. His first real cheffing job was at a friend’s fish restaurant in Suffolk, his second at the Fire Station in London’s Waterloo, before returning to Whitstable as sous chef at the Royal Native Oyster Stores then moving to the Sportsman. To achieve his egalitarian aims he soon needed help and hired sous chef Dan Flavell, who proved so useful in putting Stephen’s many ideas into practice that he was made head chef in 2004. Business has been good enough that a second pub was launched that same year, the Granville, in Lower Hardes, close to Canterbury; this is run by the chef’s sister with Jim Shave, a two-year Sportsman veteran, cooking. One of the pub’s USPs is self-sufficiency. Stephen sources his ingredients from within a couple of miles radius of the restaurant, from the three farms closest: Monkshill Farm, run by the Royal Society for the Deaf, supplies eggs and most of the meat; Waterham Farm, chickens and geese; and Mallards Farm, some of the greens. Seafood is from Whitstable shellfish company and Griggs of Hythe, whilst Hinxden Farm produces for him a raw cream and dairy products (Stephen discovered this place after tasting one of their creams at Bibendum in 1992). However, the kitchen also goes several steps further; extracting its own salt, curing its own ham, churning its own butter, growing its own vegetables…you get the idea. The chef admits that the choice of what can be cooked daily is restricted, but this sort of philosophy is what sets a genuine gastronome’s heart galloping. Indeed, Stephen’s ambition to make fine dining more accessible is really being realised with the chef admitting, ‘in a way we laid down a challenge to [Michelin] to prove that what they’d been saying for years is true. And by giving us a star I suppose they have.’ The award is the official seal of approval, but the many miles customers are willing to trek – there is a tale of four American ladies who took a black cab to the Sportsman all the way from the Dorchester Hotel, London – and the returning patrons are probably what please staff most. 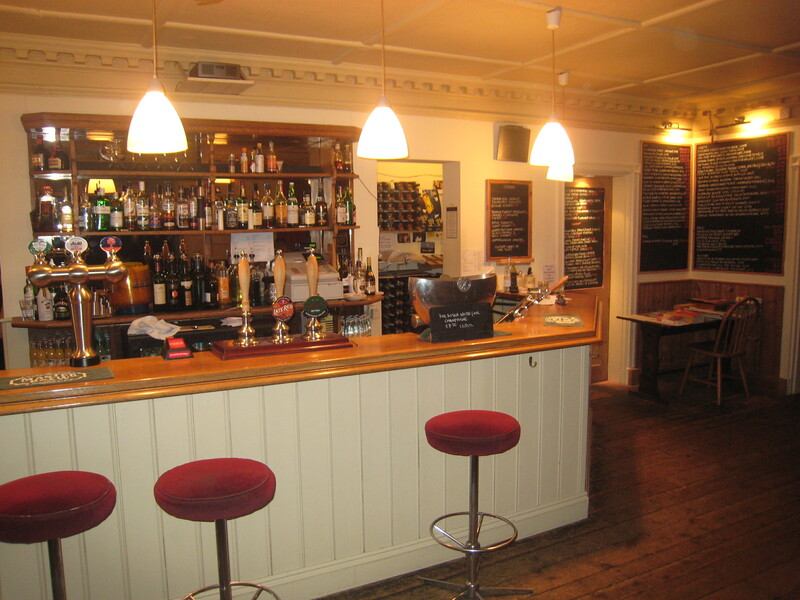 This pub, the last in Seasalter, near the gentrified old harbour town of Whitstable, lies on the Saxon Shore Way (which traces the coast as it was in Roman times and follows the line of Roman fortifications). It is historic land, loaded with much esoteric trivia. For example, this is old pirate country and, in time past, only a walk from the Sportsman, smugglers would divvy up their booty at the Blue Anchor, another pub. With regards to my maiden mots, these were justes indeed, as the neighbouring Swale estuary was popular and agreeable anchorage for prison ships and it is still possible to imagine Pip and Magwitch mincing around this marshland; there are also rumours that this scenery stirred Daniel Defoe to write Robinson Crusoe. The area has gastro-ancestry too; it was entered in the Doomsday Book as hinterland for the kitchens of Canterbury cathedral, feeding the tourist trade that followed the murder of Thomas Becket and there is evidence suggesting an inn was first founded on the restaurant’s current site as far back as 1642. Today, as mentioned, the Sportsman sits alone among the salt marshes (except for the grazing sheep, waiting for the chef’s call); Stephen’s own directions, ‘take the Seasalter turn-off, then drive until you think the road runs out’, stress the seclusion. The bright, white pub stands like a beacon against the gloomy, winter backdrop. Through the front door and small conservatory that circumvents the building proper, the restaurant is light, airy and welcoming with room for about fifty covers. The bar is in the middle of the butter-coloured front area; to the right, blackboards boast the day’s dishes and an authentic fireplace invites drinkers and diners closer. The interior was refurbished by the staff and around this room and in the smaller dining spaces to the left and further to the right, a collage of colonial-style chairs and tongue-and-groove tables of oak, cherry and pine made by John Ford from reclaimed timber have been collected. The floor is stripped and scrubbed pine and each piece of furniture is unique; it is rough and ready yet certainly comfy. Stephen is proud to be the only Michelin star holder without tablecloths and Derek Bulmer, editor of the British Michelin guides, supports the informality, declaring after dinner here that he ‘detect[s] a real movement towards simplicity and people recognising that doesn’t mean compromising on the quality of the food’. 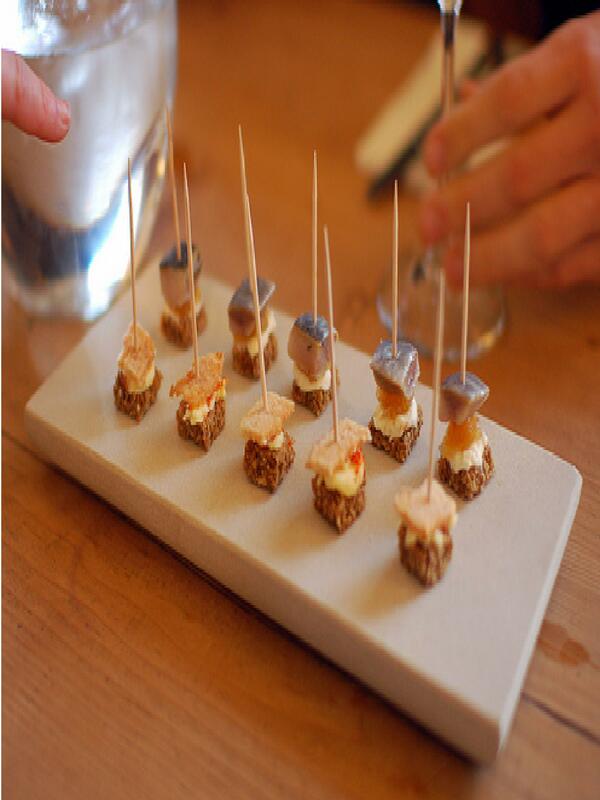 Canapés: Pickled herring; and bacon. Lunch was launched with two sets of trussed treats: homemade soda bread squares and plump pieces of pickled herring, with apply jelly and buttermilk between; and others with bacon, rendered bacon fat, buttermilk and soda bread. The sour, rich herring and perky, acidic apple tallied well; the creamy buttermilk and soda bread – made with this same milk – added texture and depth. I was unable to test the bacon bite. 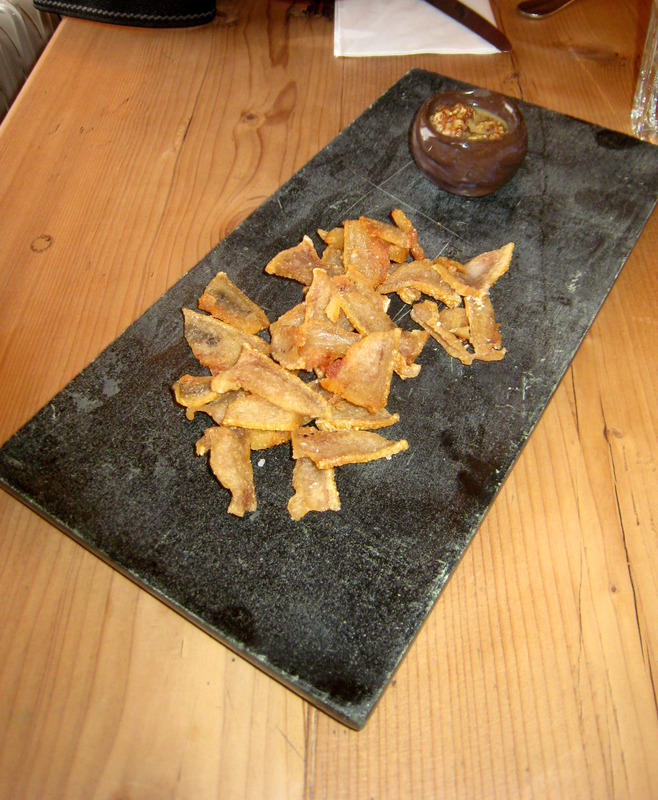 Canapés 2: Pork scratchings. 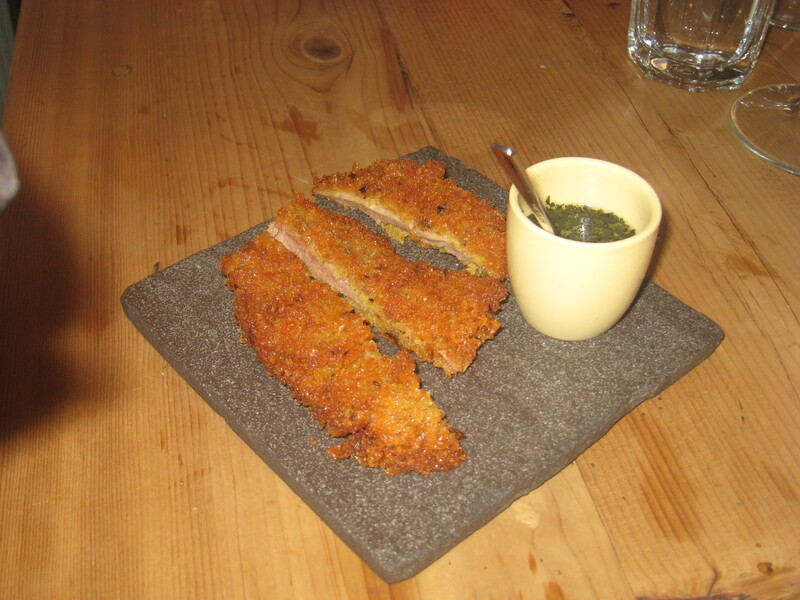 A cluster of crispy cuts of deep-fried pork skin came with a pot of apple-spiced grain mustard. Unable to try the scratchings, I still sampled the mustard. Sharp at once, the fruity sweetness soon fed through; what with apple and grain mustard both being classic condiments with pork, I imagine together they must have made a tasty team. 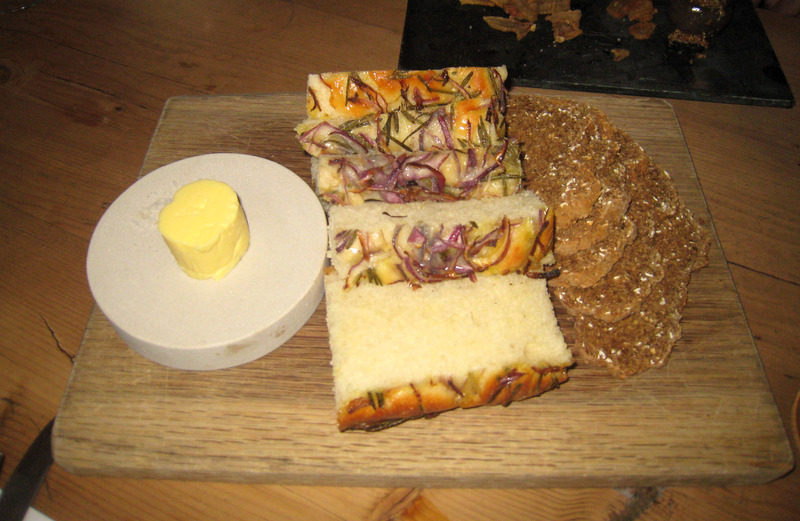 Bread & Butter: Red onion & rosemary focaccia; and soda bread. Huge homemade hunks of fluffy focaccia, brioche-like and generously garnished with herby rosemary and sweet red onion, coupled thin, dense, honeyed soda bread. 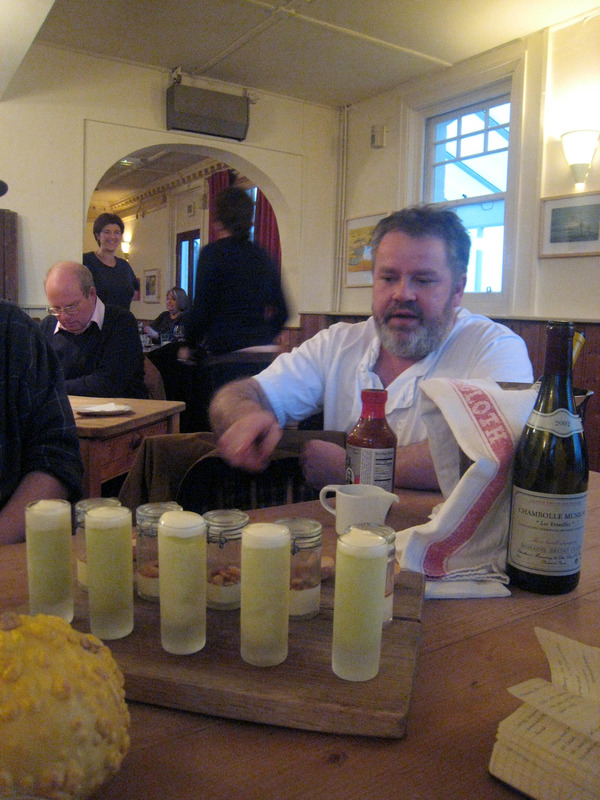 The butter is also made by the kitchen and has good taste and creaminess; it is sprinkled with sel gris, gathered by boiling off the seawater from behind the pub itself. This single plate probably summed up what the Sportsman is all about better than any other. All the elements were made onsite from local ingredients with nothing squandered; the buttermilk left over from the butter-making process is used for the soda bread. Oh, and it all tasted very good too, by the way. 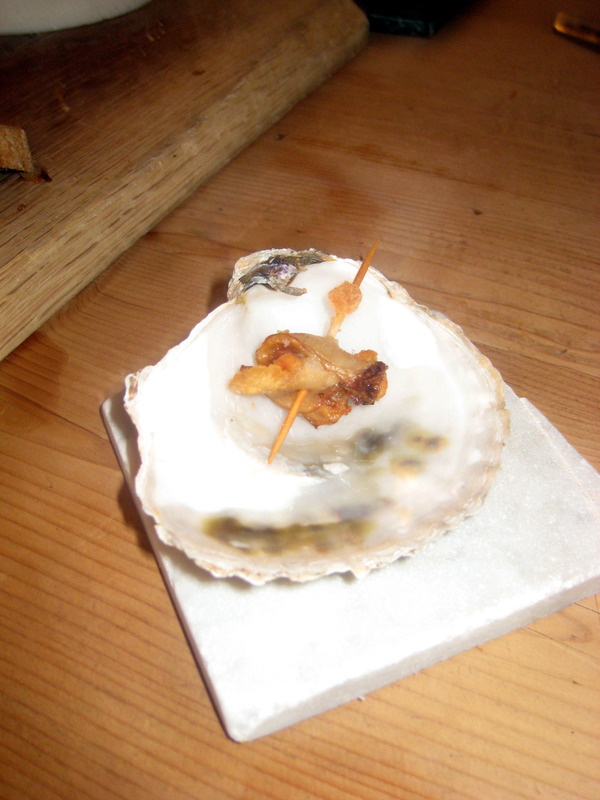 Starter 1: Rock oyster with lardo; and rock oyster with hot chorizo. 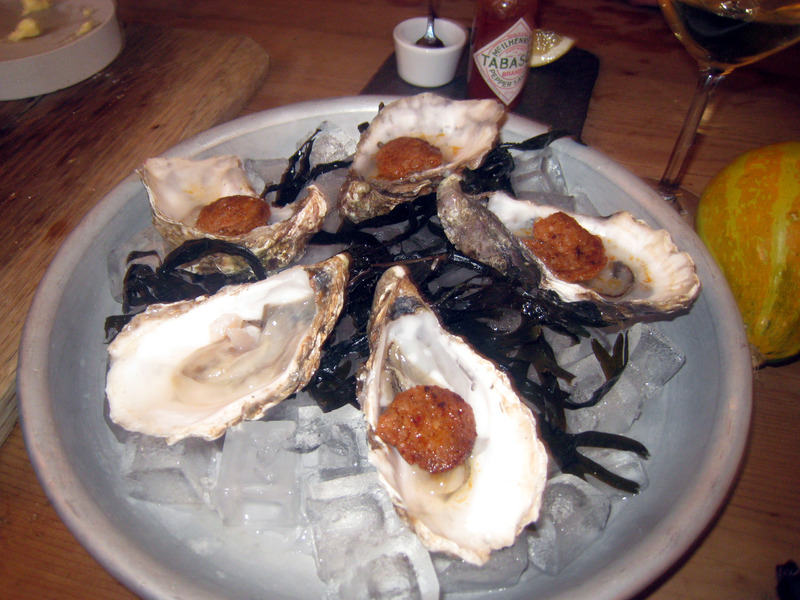 Next Stephen served two rounds of Whitstable’s own famous oyster: first, fried and folded in lardo; and secondly, raw with warm chorizo. I had to (grudgingly) give away my ‘angel on horseback’, but was able to enjoy the very clean, distinct and mineral second oyster (without spicy sausage). The presentation was rustic and pleasing; served in their shells and atop stands of seaweed, no doubt, collected from the garden. The ostrea edulis breed of bivalve is one of the most prized around the world and have been farmed here since Roman times. Starter 2: Chicken liver pâté and mushroom Carpaccio. A sienna-coloured demi-quenelle of chicken liver pâté infused with brandy, sauternes and walnut liqueur lay upon an imbricated, ivory petal-like Carpaccio of button mushroom, peppered with parmesan. The pâté was rich and verging on very sweet, but balanced by the buttons, meaty and slightly woodsy themselves; parmesan cheese added some creaminess and a little sharpness. The pâté and mushroom were a juxtaposition of colour, taste and sophistication; dark, flavourful, refined mousse contrasted against alabaster, often-labelled-plain, common fungi. But it worked. This dish, a tribute to Barbot and l’Astrance, no less, surpassed its surroundings and, in quality and presentation, demolished any ‘pub grub’ label. 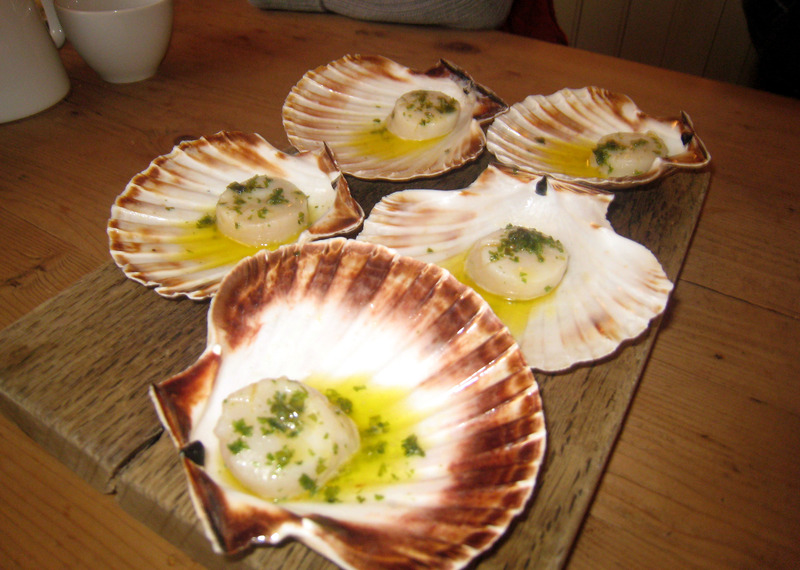 Starter 3: Scallop in seaweed butter. 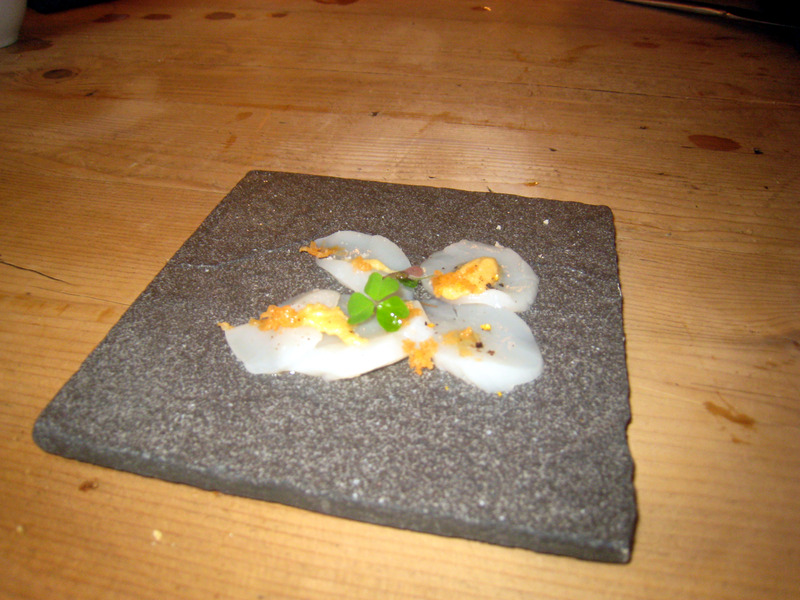 A local scallop, still sitting in its shell, was cooked in more of the house-butter, steeped in seaweed. Caught just yesterday, the shellfish was sweet and juicy, but though it had an even texture throughout, it could have done with a few moments less in the pan to leave it a little less firm. The beurre d’algue had a veggy zing that enlivened the scallop and worked off the shellfish’s sweetness. Starter 4: Scallop Carpaccio. Thick, translucent sections of scallop, delivered on dark slate slab, were decorated with brightly-coloured smoked brill roe and wood sorrel. The slightly sweet shellfish was succulent and surprised with its meaty consistency. Brill has a delicate sweetness while its roe has the same only a little stronger; this natural flavour combined with its instilled smokiness worked wonderfully. Lemony sorrel and superbly subtle salt seasoning helped make this one of the dishes of the day. Starter 5: Seasalter cured hams. 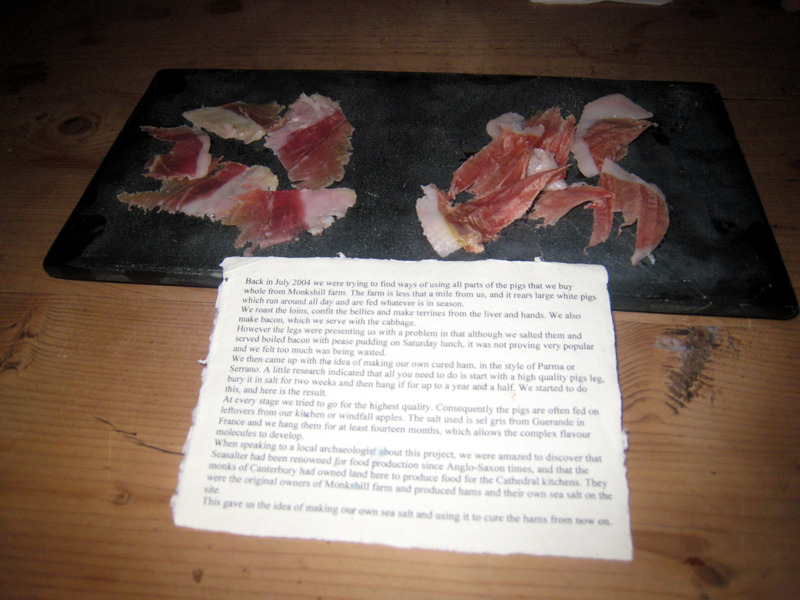 Another slab of slate served two types of cured ham – one from saddleback pigs and the other from Oxford Sandy & Black ones – both dried and salted by Stephen himself using the aforementioned self-extracted sea salt. Now, obviously, I am unable to comment on this course well, but I will try to inform you as best I can. Apparently, the Saddleback sort – a rare breed that matures slowly and gives the pork a good marbling of fat – was softer, smoother and slightly fruity. The Sandy & Black breed, one of Britain’s oldest and tastiest, was waxier and saltier. The idea behind producing his own Serrano-style pork came from a worry over wastage; having successfully found uses for the pig’s loins, bellies, liver and hands, they had trouble figuring out what to do with the legs. This is when they hit upon the idea of making their own ham. So, after feeding the large white pigs that are reared on Monkshill Farm, just a mile away, with leftovers from the kitchen themselves, by hand, they take the legs, bury them in their own sel gris, then hang the ham for at least fourteen months. They later found out that they were simply carrying on Seasalter’s pork-salting tradition of Anglo-Saxon days when monks from Canterbury cathedral did the same. Starter 6: Crab Risotto. 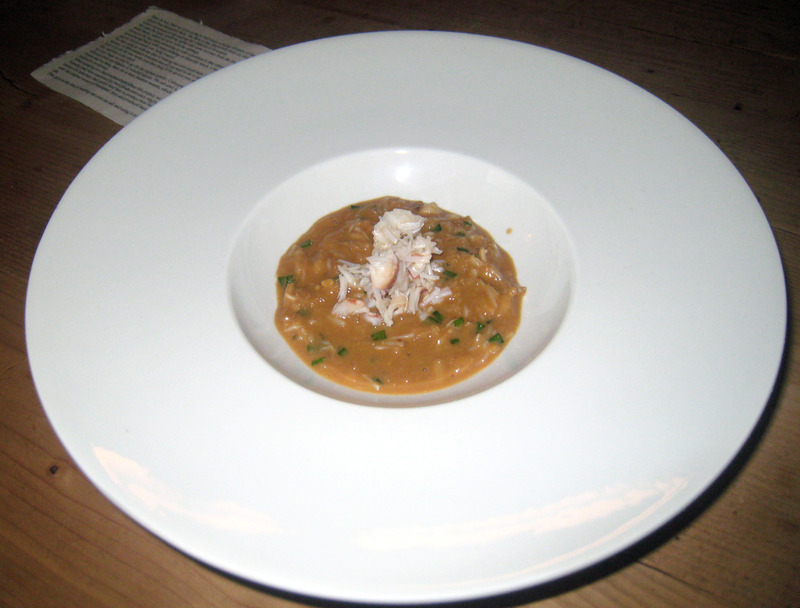 A bowlful of mahogany-coloured crab risotto, topped with the crustacean’s raw white flesh was brought next. The stock, of brown meat, a dash of crème fraîche and pinch of parmesan, had dark, rich intensity like concentrated bisque. The consistency of the rice itself, although wetter and more liquid than usual, was unanimously approved of. The strength of flavour in this was startling. 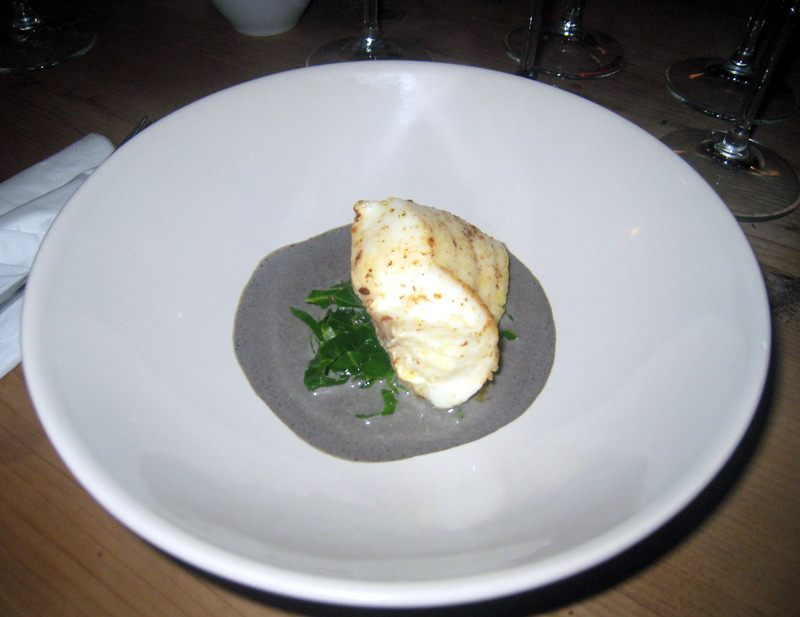 Plat Principal 1: Turbot with smoked herring roe sauce. A choice chunk of ivory turbot fillet, covered with golden flicks, resting upon dark green, sautéed sprout tops, sat in a metallic silver sauce of smoked Avruga caviar. The steak-like turbot, literally the catch of the day, was firm and flavourful, though by eating it so soon out the water, we may have missed out on the benefits of the breakdown of fat that happens naturally and enriches the meat. Nevertheless, it was good and excellently complemented by the delicious herring roe sauce, which was slightly smoky and lemony-acidic without any overt fishiness to it. Sprout tops, the rosette of leaves from atop a stem of Brussels sprouts, had an agreeable and corresponding citric savour, as well as nice crunch. One member of our party opted for an equally tasty vin Jaune sauce as he had enjoyed the Avruga many times already. Entremet: Monkshill Farm lamb belly and mint sauce. Pre-meat main saw lamb belly St Ménéhoulde matched with mint sauce. The moist, fatty meat had been bread-crumbed, then fried and served as epigrammes. The lamb also came from close by Monkshill farm and was a Tese sheep (a Charolais and Suffolk cross); it was delicately sweet and subtle. A thin layer of mustard, under the crumb crust, coasted the meat to delightful effect. The mint sauce, tangy and sweetly-sour, was based on Elizabeth David’s recipe and made with fresh mint, sugar syrup solution and malt vinegar. Plat Principal 2: Roast Monkshill Farm lamb loin and braised shoulder. 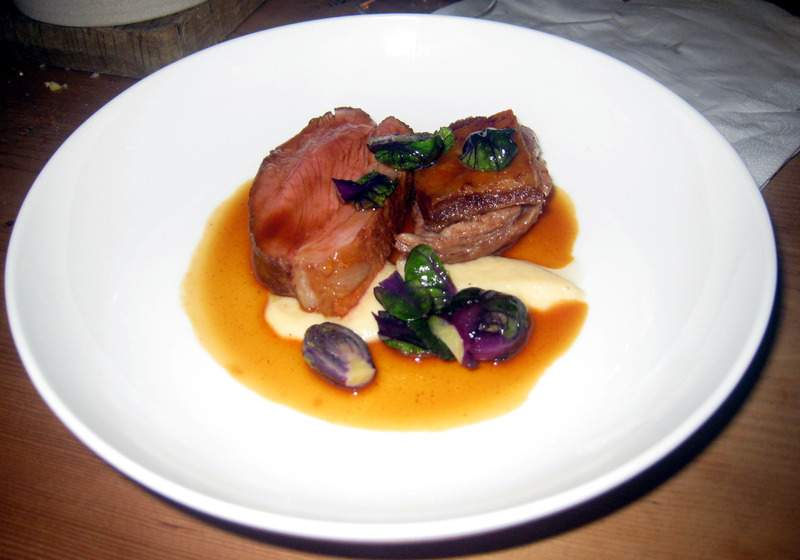 The meat course proper was more Monkshill lamb, served two ways – roasted loin and braised shoulder – partnered with purple Brussels sprouts, bread sauce and resting in jus roti. Lamb’s loin was tasty, soft and came with a sneaky strip of fat, whilst the shoulder, sweeter and more succulent, was almost confit like and had crisp crackling. The great texture of the meat was most apparent with the loin where its specific striations were discernable. The bread sauce was decent, but the sticky jus was full of lamby richness. Purple sprouts, milder and nuttier than their common green cousins, offered bite as well as pretty purple colour. 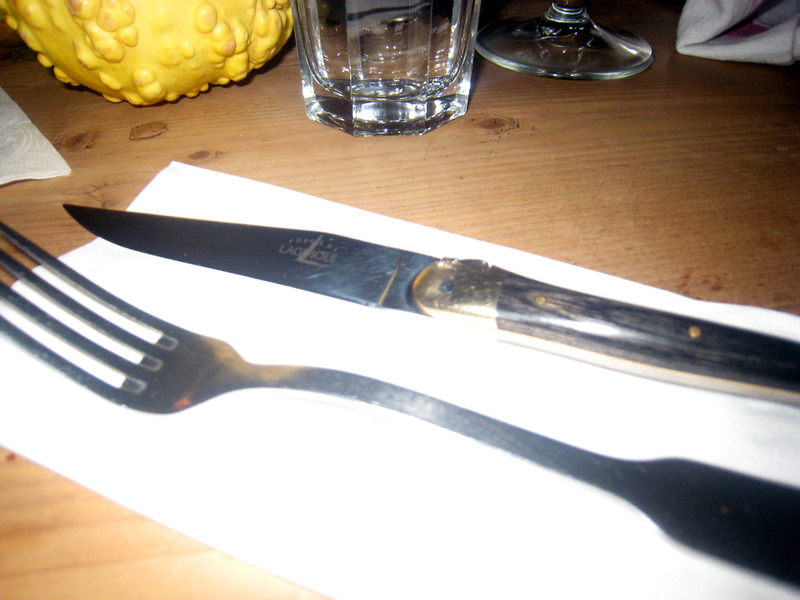 This course came with custom Laguiole knives monogrammed with ‘the Sportsman’. Dessert 1: Strawberry ice lolly and brioche cake-milk. 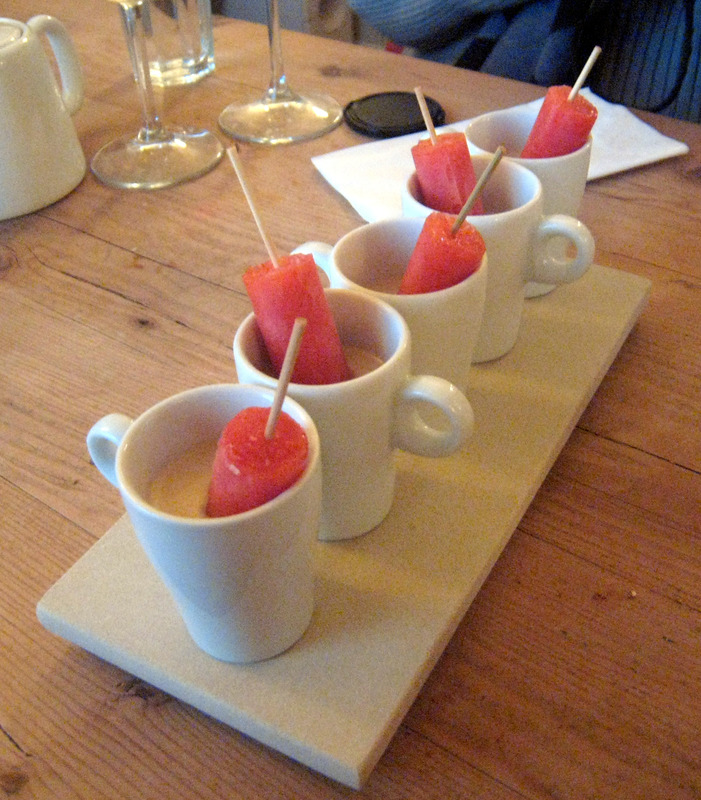 An ice lolly, made with the last of the summer’s strawberries, lay in a cup containing dissolved Norman brioche. The lolly was, of course, very cold, but the fruit essence evident; it was also a pleasing contrast to the temperate cake milk, which was like melted butter sponge in cream. A yummy and light-hearted little pre-dessert. 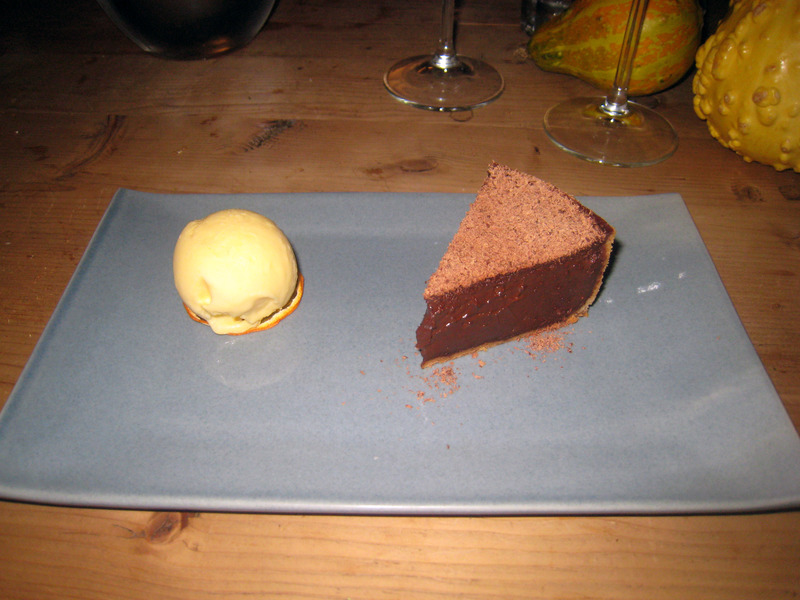 Dessert 2: Dark chocolate tart and tangerine ice cream. A weighty wedge of Santo Dominguan bitter Cocoa Barry coco cake, dusted with El Rey 73% chocolate, was teamed with tangerine ice cream that came atop crunchy tangerine slice. The 70% chocolate mousse, encased in a soft, thin crust, had deep, long, lingering finish, but was lighter than expected. The El Rey, scattered upon it, had faint fruitiness and acidity, making the tangerine ice cream a superb foil. The crispiness of the fruit slice startled us all; it was an exquisite touch. 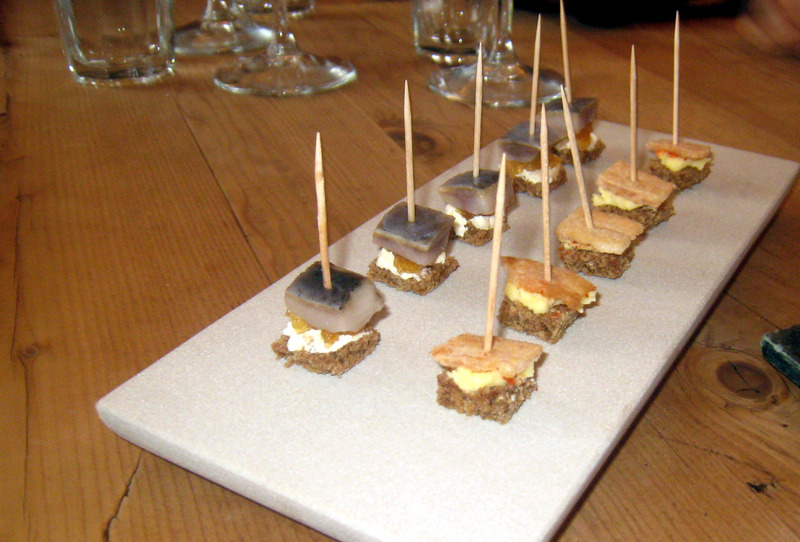 Petit Fours: Gypsy tart; jasmine tea junket, rosehip syrup & breakfast crunch; and green apple parfait. 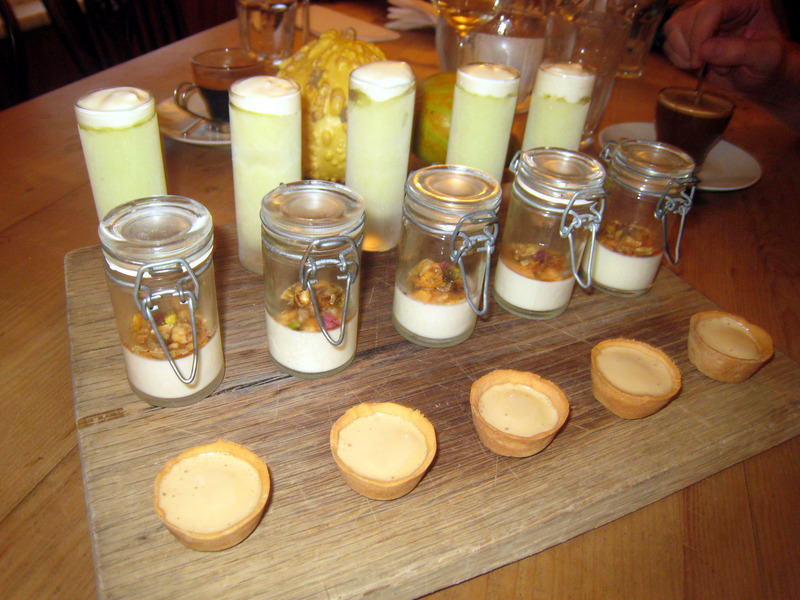 A flight of petit fours landed at the table: a tall shot of green apple parfait rounded off with a spot of yoghurt; a little kilner jar of jasmine tea junket, rosehip syrup and breakfast crunch; and baby Gypsy tart. 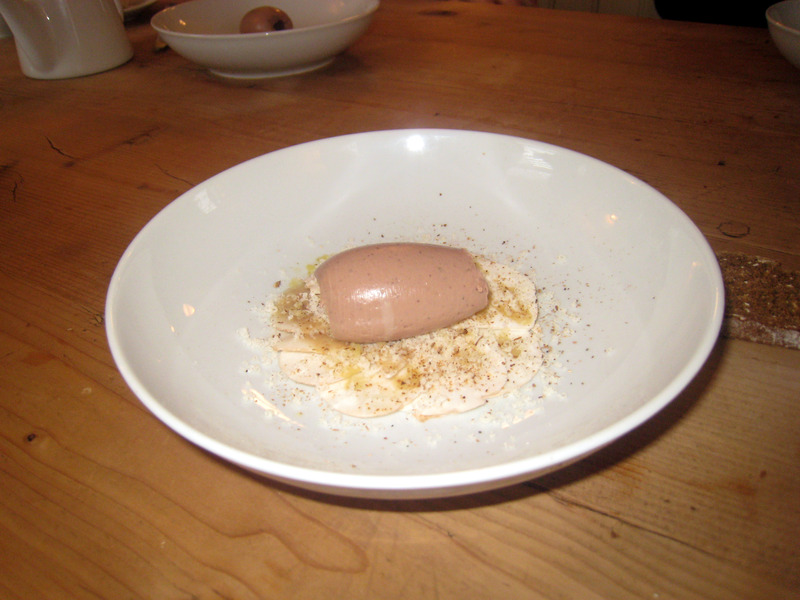 The parfait was similar to apple sorbet with good density, texture and a small surprise within that delighted us all: space dust, the inspiration for which came following a visit to the Fat Duck. Junket, a milk pudding or British pannacotta, if you will, had light floral flavour mulled with some sugary rosehip syrup and was topped with a crunchy collection of rice crispies, dried fruits, nuts and seeds. A classic Kent school treat, Gypsy (or treacle) tart, composed of condensed milk and brown sugar, comprised crisp pastry and sweet, light butterscotch filling. This was simply one of my best meals of the year. Each element – the cooking, the ingredients, companions, setting and even the thinking behind the food – came together to produce something immediately memorable. In from the cold and rain, fondly greeted and placed next to a warm fire, then served course upon course of carefully crafted dish made with the finest, freshest produce available: this was cuisine de terroir at its finest. The ethos here alone was almost enough to win me over; the chef is clearly passionate about what he is doing and is always keen to improve himself. Possibly, partly because of his late arrival to professional cooking (started at 33), he feels he has more to prove and that is what pushes him to see exactly how far he can go, how much he can do independently. This is great for his customers, whom he openly appreciates; ‘the key is to remain ambitious but not do more than you are capable of. We’re a destination pub so we have no choice to offer food people are going to travel for’ (FYI, I travelled 113 miles). A self-confessed ‘restaurant nerd’, Stephen also spends the money he saves on visiting the world’s greatest tables with Emma, bringing back new ideas; besides a couple of the flourishes already revealed today, another is his own twist on Bras’ gargouillou with the 300-year-old English salad, salmagundi. I enjoyed the seriousness of the savouries, showing off big boy abilities just as much as the playful puddings that proceeded them; it is obvious the chef likes to use desserts as his chance to relax and have a little fun – the cake-milk especially, was so simple, but scrumptious still. It is hard to pick a favourite plate, but the presentation of the pâté, the taste of the scallop Carpaccio and the sleek Avruga sauce are still vivid in my mind. Stephen himself makes a perceptive point: ‘I thought it would be fun to try and match that standard of food but serve it in a pub. I learnt how to cook by eating at MPW’s, Ramsay’s and all the other top chef’s places, but removed the superfluous extras….I think we can say the idea has worked, especially as chefs who unknowingly taught me to cook are now launching chains of gastropubs’. (I had to finish like this). Now, I know Carlsberg don’t do pubs…wait, maybe they do, but let us pretend they do not…but if they did, it would be the Sportsman. That is high praise from you indeed, FS. 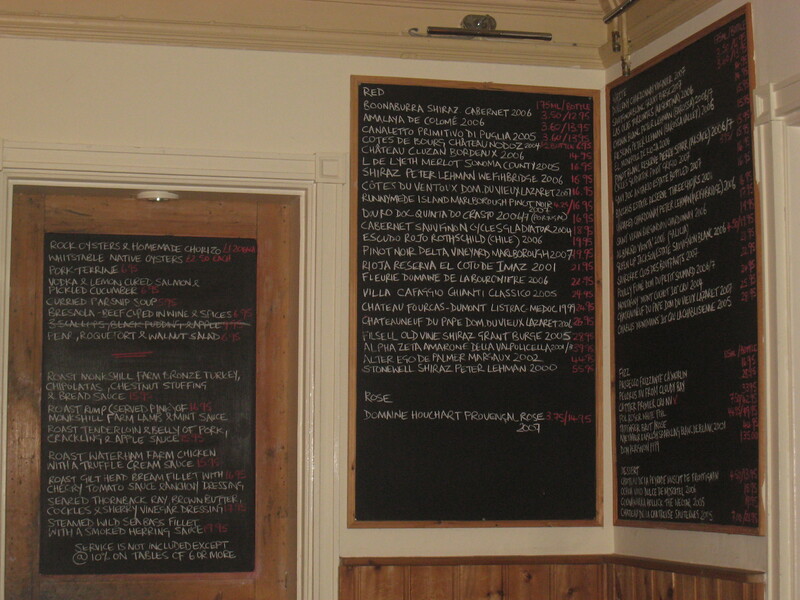 The Sportsman is probably the best gastro pub in Britain, by a long long long way. Great post, food snob. But then I would say that given a significant element of it was written by me, published elsewhere and nicked by you. (blush, blush) Jay makes a good point. Many of Stephen’s quotations and those of Derek Bulmer’s were given to him during interviews. Jay is somewhat of an authority on the Sportsman having written more extensively on it than anyone else I have seen. Thus, some of facts do overlap (which of course he doesn’t object to sharing), but I must make a habit of correctly declaring my sources. At least, the elegant prose is my own! I’m convinced… you had me at pork scratchings! The food here is much more ambitious than some high-end restaurants in London (e.g. 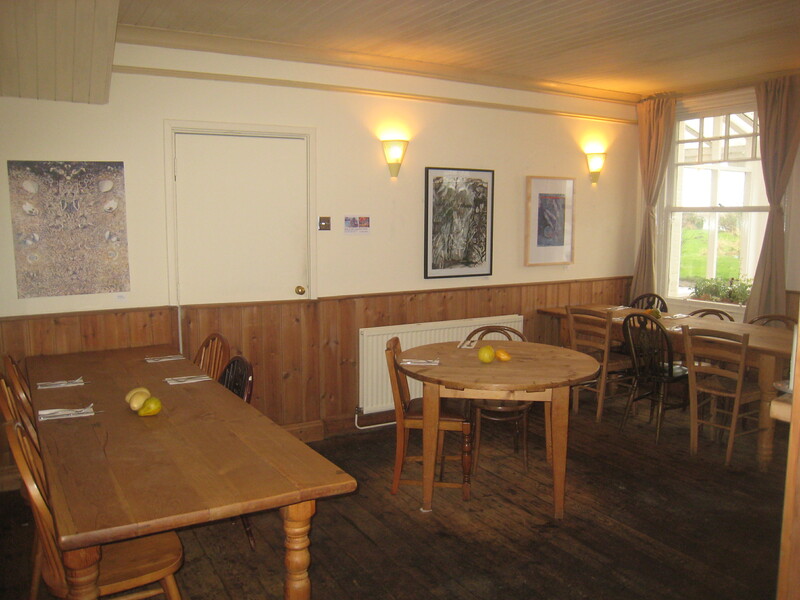 Boxwood cafe) especially bearing in mind this is ‘just’ a gastro-pub. btw picture of the bread doesn’t work properly. the foccacia kinda looks like a cake. Indeed, many more trips hopefully. It is about 1hr10, but it’s worth it! Yup, I saw that. Did he not say how it seems to be a little less impressive than his first visit? That said, C&B (http://cheesenbiscuits.blogspot.com/2008/12/andaman-st-james.html) thought it decent. 1hr 10 fm ashford? I might as well just nip to paris for a couple of meals there then. Writing up on launceston place – should be up (hopefully) later tonight. There may be other quicker trains though. lol. Look forward to reading it. Interesting post. But may I please make the point that the ‘D.B.’ you mention was not me? Hi food snob nice to see you get out of the “office” sometimes lol. However in early january I am planning a back to back visit to The Hand and Flowers and The Goose, one in oxon the other in bucks.To visit both will involve an overnight stay,which adds to the excitement. As they are both michelin starred I,m expecting top quality. The Hand and Flowers has been recommended to me a few times and has been on my hit list for some time. Definitely agree that ‘destination dining’ has its own delights, though probably allows for even bigger disappointments too! In this case, it all worked wonderfully. I hope your little jolly does too. Looks soo amazing. Can’t wait venture out here! A comment from nugget? Now that is precious indeed! A terrific review, FS, as ever. I’ll certainly be heading out there in the new year. Wonderful to see Michelin honouring the homely as well as the haute. What the chef is doing out there is really terrific. Now that you have tried a restaurant outside the M25 Lol, you have no excuse not to go to Le Champignon Sauvage now do you, P.S Merry Christmas and a happy new year. Lol, I have been expecting that comment. Good morning food snob.Kent Paul is spot on.Cheltenham is not a huge trek from London.Sorry if this sounds as though we are ganging up on you. Over the years David Everitt-Mathias has been delivering top nosh to every lucky customer to cross his threshold. As you may be aware I am a big fan,and over the years have dined there a number of times. It would be most interesting to read your comments. gang up if you wish – after all, peer pressure is the friendliest form of encouragement…it shows you really care plus it always works. You too, Merry Christmas and Happy New Year! While I am at it, Happy Eating to all! Happy upcoming New Year 2009 to you, FS ! Seeing as we are all bigging up LCS and telling FS to go there, i personally hope that i have not jinxed the restauarnt, and FS has a bad meal there?. LA: Thanks and the same to you! KP: Quite right. I wouldn’t be at all surprised!! So were are you going in january then mate. Well, if you really must spoil the surprise…email me. It’s ok i will wait to be supprised like the rest of us on here. You won’t regret it, I hope. Just stay away from the Aberdeen Angus Steak house and you will be fine. Great blog. Keep up the good work, Happy New Year to you! Great report, FS! I like all the details about Steve and the place. 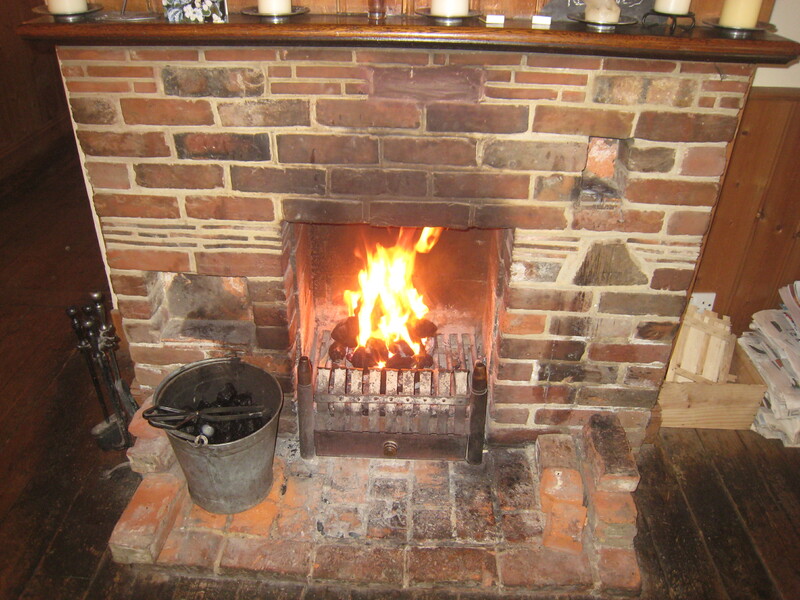 The very best part is the way you describe going there early in the morning and getting to Seasalter and entering the pub, deliciously personal and picturisk! I am really happy you liked it! It just happened to work out sooo well…it’s a great memory. Hope I get a chance to come to London (area) soon so I can experience this unique place. Cheers and you’re very welcome. i’m not a big blogger but i must say how happy i was to read this super account of ‘The Sportsman’ in Seasalter. it is a wonderful place to eat and is my wife and i’s favourite restaurant in the world. we used to live in rochester and visited on special occasions including just before we came out here to kenya 2 years ago. then i had the crab rissoto which is still the best thing i have ever tasted…alas now in kenya the SM is many miles away and your review brought back some great memories, thank you. incidently, when did they get their star? Could not agree with you more, Ed. 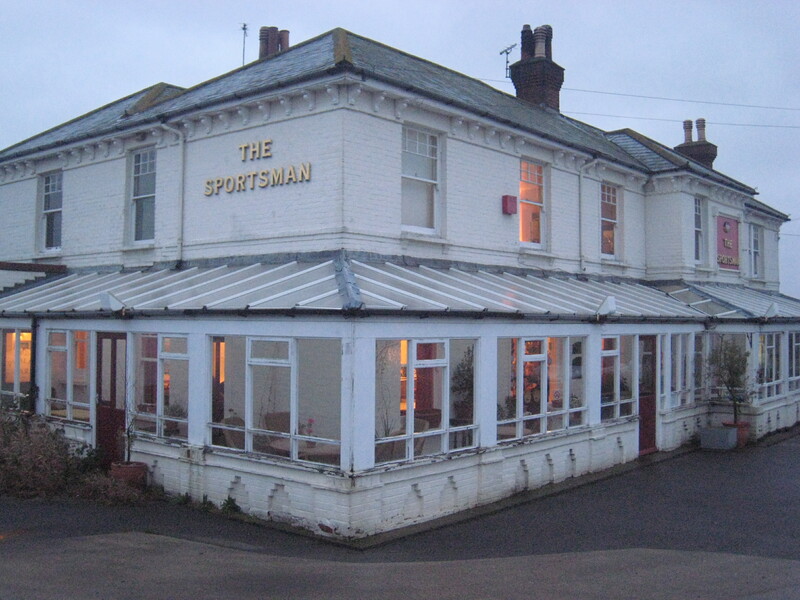 The Sportsman is one of my favourites! They got their first in January 2008. The cacao you mentioned, its called EL REY. Venezuelan.